Watch Sue McMahon’s full step-by-step video to make the perfect buttercream macaroons. 1. Set the oven to 150C/gas mark 2. Tip the ground almonds and icing sugar into the bowl of a food processor and whizz until very finely ground. 2. Sift the almond mixture 2-3 times on to a sheet of baking parchment. 3. Pour 50ml water into a pan and add the caster sugar for the macaroons. Place the pan over a low heat and stir until the sugar crystals dissolve. Wash down any crystals from the side of the pan with a damp pastry brush and increase the heat and boil the syrup rapidly until it reaches 121C on a cooking thermometer. 4. Meanwhile, tip the 75g egg white into the bowl of a food mixer, preferably a tabletop mixer, and when the syrup is about 115C, start whisking the egg white until stiff. When the syrup is at the right temperature, pour it in a slow, steady stream over the egg whites, whisking continually until the mixture is thick and cools slightly. 5. Tip the almond mixture into the bowl of the mixer and add food colouring. Use the mixer on a slow speed to mix the almonds into the meringue. 6. Remove the bowl from the food mixer and fold in the 30g egg white to loosen the macaroon mixture. 7. Fit the large piping tube into the piping bag, and fill with the macaroon mixture. 8. Place a lined baking sheet on a tea towel and pipe small blobs of the mixture onto it, leaving some space between them, as the mixture will spread out a little. Tap the baking sheet several times on the tea towel, to give a smooth surface to the macaroons. 9. Bake the macaroons in the oven for about 12-15 mins, or until they feel as if they’ve set. Open the oven door briefly a couple of times during cooking, to release any steam from the oven. Remove the baking sheets from the oven and slide the baking parchment on to a wire rack for the macaroons to cool completely. 10. To make the buttercream filling, pour 50ml water into a pan and add the caster sugar and salt. 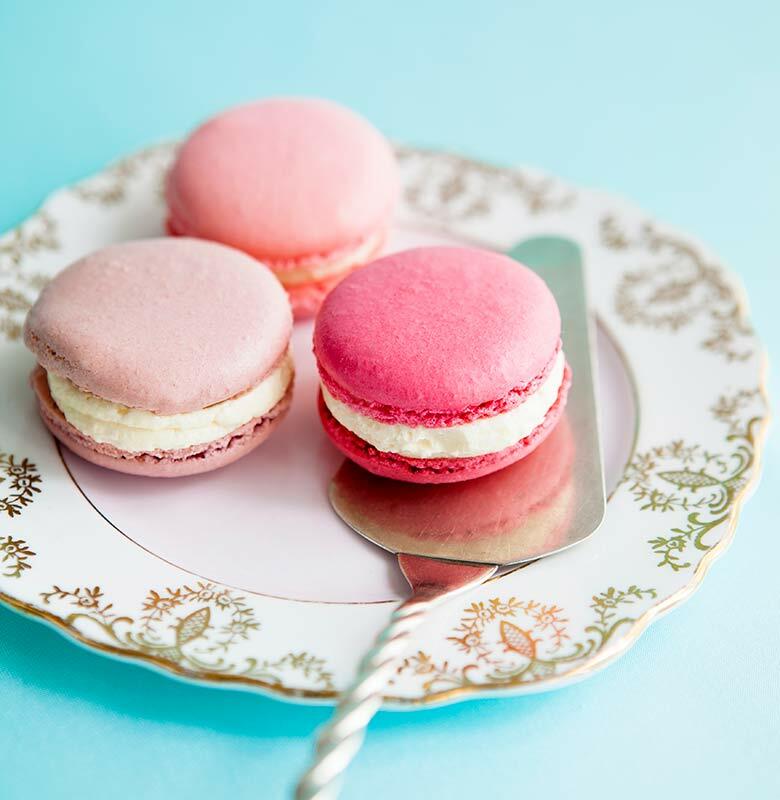 Cook the syrup to make a meringue with the egg whites, following the method in steps 1-5 of how to make the macaroons. smooth buttercream. Whisk in your chosen flavouring to taste. 12. Fill a piping bag, fitted with the plain piping tube, with the buttercream, pipe some mixture on to half the macaroons, and top with the other half, pressing them together lightly. Make sure you weigh the ingredients out accurately. Make a separate batch of mixture for each colour, rather than trying to divide it to make different colours. If using liquid colours, check that they are concentrated colours, such as Squires Kitchen Professional Liquid Food Colour, or use powder food colourings, such as the Squires Kitchen Professional Dust Food Colour. If you can’t get all the baking sheets with the macaroons in the oven at the same time, you can leave the piped ones for up to 30 minutes before baking them. I used Two Chicks liquid egg white, which comes as a chilled product in a carton. It saves wasting egg yolks and is easier to measure out. When folding in the extra egg white into the macaroon mixture, tap the bowl and the surface should level to give a smooth surface. If it doesn’t then stir the mixture roughly to soften it down a little.